The history of hockey is almost as messy as some of the fights on the ice of pro hockey rinks. Some historians trace the game back to hurley, an Irish field game that was played year round with a ball and a stick. Other historians say the game derived from Lacrosse and other field games played by the Micmac Indians in Nova Scotia. Yet another school of thought says hockey developed in Northern Europe were field hockey was played on frozen lakes in the winter. This eventually developed into the English game of bandy. Did you get all of that? Before we argue about who is correct and send the others to the penalty box, let’s just agree that hockey was probably influenced by several earlier stick and ball games. We’ll then pick up the history of the sport in the mid 19th Century. Canada is without argument the homeland of modern hockey. 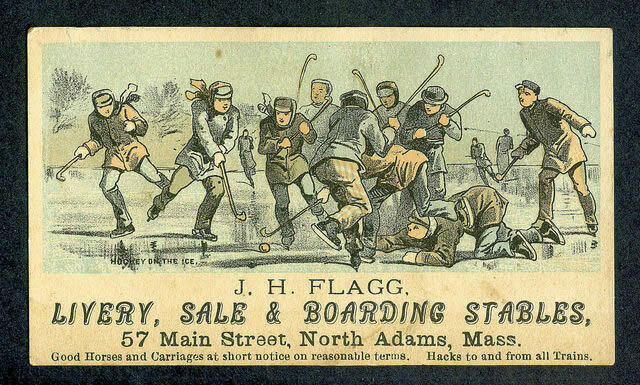 British soldiers stationed at Hallifax and Kingston played the first recorded hockey games in the mid 1850s. In the early 1870s students at Montreal’s McGill University drew up the first known set of ice hockey rules. These rules established the use of the puck rather than a ball and set the number of players per side at nine. The puck used by these early McGill players was square rather than round. The first amateur hockey league was organized in Kingston, Ontario in 1880. During the next decade ice hockey quickly became popular in Toronto, Ottawa, Montreal and other Canadian cities. By the end of 1893, there were more than 100 hockey clubs in Montreal alone. About that same time, the first hockey games in the United States were played at Yale and John Hopkins Universities. Ice hockey had become such a phenomenon in Canada that in 1893, the Governor General of Canada donated a permanent trophy to be presented to the best hockey team. The Governor General’s name was Lord Stanley of Preston and the silver bowl inlaid with gold that he donated became known as the Stanley Cup. The original cup cost $48.57 and is now mounted on a large base to allow room to inscribe the names of winning teams. Today, the trophy is insured for $75,000. The Stanley Cup is the oldest prize that North American Athletes vie for. It has been awarded each year since 1893 with the exception of 1919 when the competition was stopped by an influenza outbreak among the Seattle Metropolitan. The Montreal Amateur Athletic Association team won the first two Stanley Cup competitions. The beginning of the 20th Century brought a new dimension to ice hockey—the professional player. The first professional league formed in 1904 in the United States. The Pro Hockey League was started in Michigan’s Upper Peninsula and lasted three years. In 1909, the National Hockey Association was founded in Montreal. Beginning in 1912, professional teams were allowed to compete for the Stanley Cup.